Acne is one of the problems that disturb all ages.Not necessarily it will come with age ,instead it is found in all group of ages. Acne not necessarily occurs in adolescents but acne attack can happen at any age depending on the eating habits,lifestyle,hygiene,hormonal imbalance,medications,reactions to drugs etc.The best cure to this problem starts with your diet.As I say what you eat shows on your skin. Maintaining a healthy diet and an exercise routine is a must and the difference is automatically seen.Exercise improves circulation and brings glow to your face. Initially you will feel that your face has started showing more scars but that is an indication that your skin is taking out toxins.You wash your face regularly and after a couple of days you will see the difference!Diet is a crucial element in curing acne. Avoid starch,have as much fluids as possible so that your system clears ,drink at least 8-10 glasses of water and eat as much as fresh fruits,juices ,avoid packed food available in market,avoid junk food,cut down on coffee intake.These things you might have read everywhere but here I am someone who have been benefited by all this and it has seriously changed my life . Word of caution-please do not buy and apply creams available in market just on your friends advice cause that can be a hell for your face .Keep your face untouched as much as possible and keep it clean and wipe with clean towels and sleep on clean pillow covers.Cleanliness and hygiene is important. 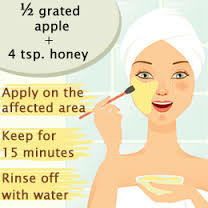 Here are some of the tips to help you fight with acne and remove scars produced by them. Tip:Always apply ice on skin before applying make-up. 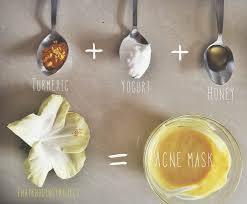 Apply fullers earth with curd .This paste is a best healer. Take one teaspoon of black pepper to which add sandalwood powder and mint leaves.Apply it for 10-15 min .Then wash with cold water.Helps fight infection. Mixture of groundnut oil and lime juice makes skin clear and moisturizes also.Carrot juice applied daily fades scars. Take cucmber juice ,add aloe-vera gel and few drops of lime .Excellent tonic to cure acne and make skin glowing. Garlic applied to skin fights infection of acne and does not produce spots.Eating them also purifies blood. A paste made of fenugreek leaves applied on face alternatively removes scars and helps preventing acne. Dab tree oil or lavender oil for persisting pimples.This will not clog your pores and will not make your skin dry. Turmeric mixed with sugarcane juice helps curing acne. Mixture of saffron and honey fades away the scars. If a pimple bursts out before an occasion apply mint paste or vicks vapour to reduce visibility and redness. Take baking soda not powder and mix with water.When the mixture dries out wash it and see the change. Take basil leaves and mint leaves.Boil them and cool them .Whenever you feel pimples bursting apply the mixture with cotton ball .It relaxes and gives a cooling effect to the skin. Buy some sea-salt from the market and apply it on the skin with water.Helps fighting acne. 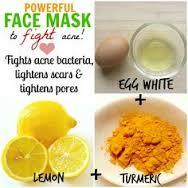 Applying of egg-white on the skin is a useful tonic for fighting acne. Take basil leaves,mint leaves dry them and in powdered form apply on skin with rosewater. Drink coconut water to fight acne and apply the rest on face. Apply calamine lotion on pimples. Apply paste of nutmeg,black pepper and apply on acne. Cinnamon and honey applied are best antiseptics. very nice informations for skin care and health.